Lakers’ Kobe Bryant participates in team practice at the Toyota Sports Center Tuesday, November 19, 2013, in El Segundo, CA. 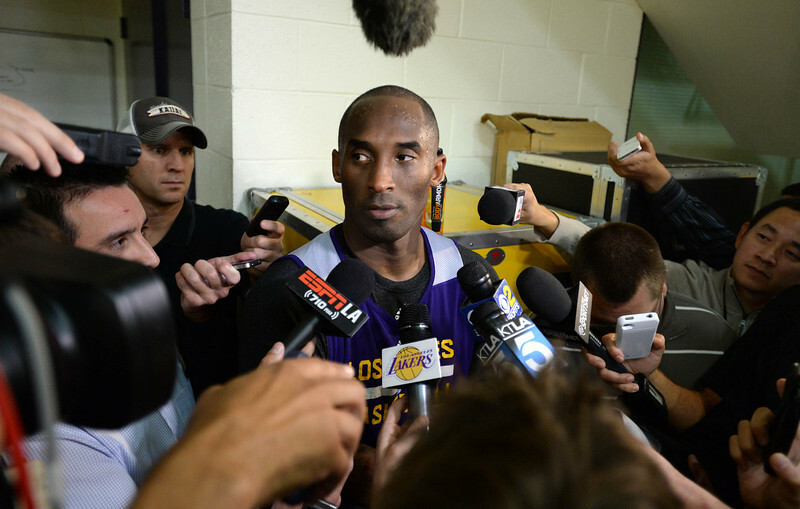 After practice, Bryant discusses with the media his return from injury. Former NBA players’ union executive director Billy Hunter accused Bryant and agent Rob Pelinka of acting on behalf of former union president Derek Fisher to end the 2011 lockout, according to a Los Angeles Superior Court filing on Thursday. In the filing that also is part of an early termination lawsuit, Hunter stated Bryant and Pelinka called him the night before he was scheduled to meet with NBA officials in October, 2011 urging him to accept a 50-50 split of basketball-related income. Hunter said in the court filing that Fisher, Bryant’s former teammate, denied secretly negotiating with the owners. Hunter also wroter Fisher indicated Bryant and Pelinka had secret negotiations with NBA deputy commissioner Adam Silver. Both sides eventually agreed to a near 50-50 split. Bryant didn’t speak to reporters on Thursday. Pelinka and Fisher’s business manager, Jamie Wior, did not return calls for comment.